Welcome friends to Natasha in Oz! I am so happy that you dropped by to say G'day. If you are new visitor to my blog, welcome! Tell me, have you ever made a zebra cake? 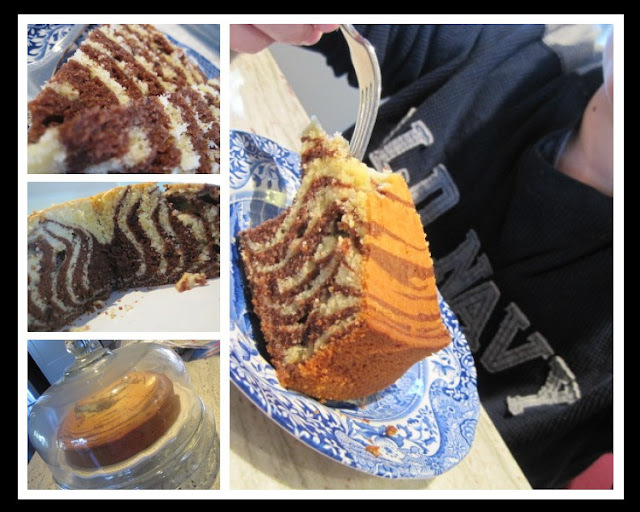 A Zebra Cake is just like a marble cake but the zebra pattern is created by pouring alternate cupfuls of vanilla and chocolate cake batter on top of one another. The great thing about a zebra cake is that it looks so fancy and intricate but it's really so simple. It's the perfect cake to show off your baking skills and impress your friends at your next afternoon tea! The zebra cake starts with vanilla batter that is divided in half and has cocoa powder added to 1/2 of it. The batters are then alternately spooned into the center of a prepared baking pan to form a bullseye design. You are going to love this Zebra Cake Recipe! This delicious Zebra Cake Recipe is fun because of the zebra striped effect on the inside of the cake. Preheat oven to 350F. Line a 9-inch round cake pan with a circle of parchment paper and lightly grease the bottom and sides of the pan.In a large bowl, mix together eggs and sugar until mixture is light and creamy and the sugar has mostly been dissolved. Stir in milk, oil and vanilla. In another bowl, whisk together the flour, baking powder and salt. Add the flour mixture and mix just until blended. The batter will be of pouring consistency but not thin. Now pour half of the batter into another bowl. Add the cocoa powder to one portion and stir lightly to blend. Place the baking pan in front of you and then place the bowl of white cake batter to the left of the pan and the bowl of chocolate batter to the right of the pan. Using a 1/4 measuring cup for each of the batters, pour a cupful of the white cake batter onto the center of the pan. Then, pour a cupful of the chocolate batter directly at the center of the cupful of white cake batter. Alternate between the two batters and repeat the technique until all the batter has been used up. By the way, there is no need to wait for the batter to spread before pouring in the next cupful. Bake for about 40-50 minutes, until the cake is light gold and a tester inserted into the center of the cake comes out clean. Wait for about 10 minutes, invert onto a cake plate and enjoy this delicious and very pretty cake!Because of the oil content, this cake will stay moist and delicious for 2-3 days. Using a 1/4 measuring cup for each of the batters, pour a cupful of the white cake batter onto the center of the pan. Then, pour a cupful of the chocolate batter directly at the center of the cupful of white cake batter. Alternate between the two batters and repeat the technique until all the batter has been used up. We enjoyed eating this yummy zebra cake straight out of the oven but, because of the oil content, it will stay moist and delicious for 2-3 days. 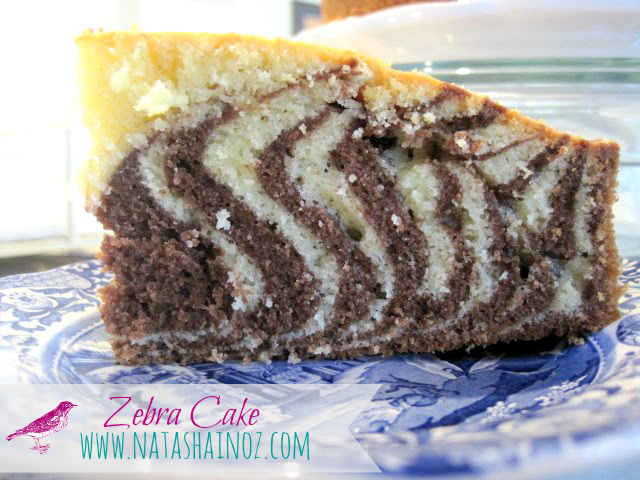 I am sure you will love Zebra Cake! I love it so much I am off to go and have a 2nd piece...well, maybe it's my 3rd but don't tell anyone! 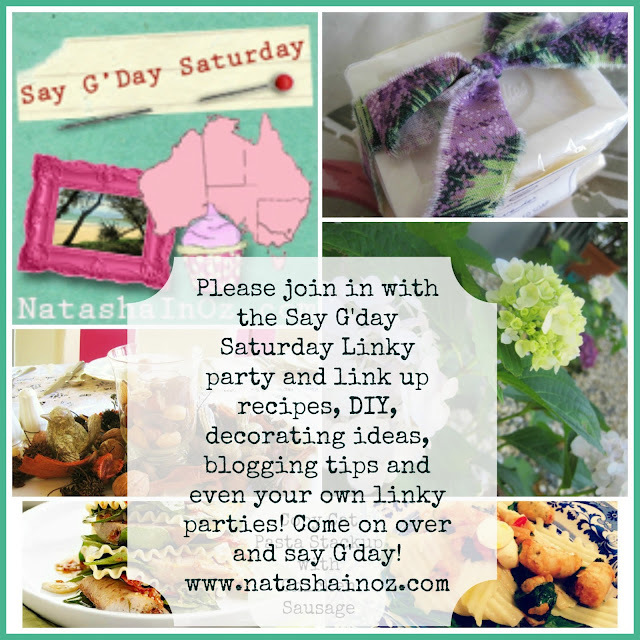 By the way, if you would like to join in with this week's Say G'Day Linky Party just click here or the picture below! I'd be so honoured if you could link up your favourite recipes, crafts, DIY, decorating tips, instagram pictures...anything that you would like to share! Both impressive for adults and fascinating for children - what a perfect cake. This is such a fun cake. It would be great to have at zoo themed birthday party. This look is so much more intriguing than the average marble cake. Really love the design it creates. That is one tasty looking cake that I feel I should try to make. Thanks for sharing Natasha. Yummy and interesting looking cake! Thanks for the recipe. What a yummy looking cake, DH prefers "plain" cakes and this one looks just up his street. Wow, that really looks delicious! I hope I get a chance to do some baking this weekend, I really want to try that. And it sounds like something fun for kids to help out with. You're right, this makes a pretty presentation. My birthday's coming up next month. I'm remembering this one! Thanks, my friend. I'm currently wishing I was down under. Supposed to approach the record of 117 degrees today. And that is NASTY! Delicious ‘Z’ post – will bake it when I next have company. A lot of company otherwise too tempting for my hips as well! It’s been such fun reading great posts like yours over the past 26 weeks! Fun and yet not too difficult - great idea!! This is amazing. I have a sister in law in love with giraffes. I can't wait to make this for her. I love this zebra cake...very beautifully done. I had my own version by using egg whites, you may be interested. Oh boy does this look yummy! Such a pretty tutorial too! Happy Z day Natasha! That's so fun, I saw it on kingarthurflour.com and they were talking about making them different colors with food coloring to-enjoy! this looks amazing! I have this on my 'to do' list!!!! Wow, how cool is that. I've never heard of a zebra cake, neat. Great Z post. I was thinking about doing tea for my birthday in a couple of weeks and I might actually have to add this to the menu. Thank you... this is going to be delicious. I'm impressed...it really is pretty and does look like it was difficult to do. Why have I never heard of a zebra cake? What a fun and easy recipe, and I bet it is delicious. What a beautiful cake! I'm not much of a cook, but maybe I could handle this! I've never made one, but after seeing those pictures, I guess I'm going to have to try it! I have never heard of such a thing before. It is a beautiful cake! I am copying the recipe right now...I really, really want to make this! MMM! Looks so yummy! It reminds me of this checkerboard cake my friend used to make in high school for all her parties. Who knew you could make cakes so pretty just with the cake batter?! I made a red and blue one for Memorial Day, (my mom always made different colors), but I had no idea it was a Zebra Cake and love your idea with vanilla and chocolate. It's really beautiful and I will try your variety...thanks. Now put your feet up, please, just for 5 minutes! That is so cool! I'm gonna try that one. Thanks so much. I'll have to make this for my grandsons when I visit - they'll be very impressed! We would probably call that a marble cake but I like Zebra cake better. Either way it looks damn good! What a fun cake!! Looks delicious, too! Lovely. I've been looking for good excuse to make a zebra cake for quite a while now. I love the way yours turned out. It's lovely! Yummy indeed! I just love the zebra idea -- I think you could have hours of fun with all sorts of themes. Thanks for sharing and for linking up this week my darling. I just love having your support. Wow, the cake looks HEAVENLY! And I just love the zebra designs on it. I'd never heard of a zebra cake. I think I'll try your recipe. Thanks so much for sharing! Love your tutorial! It's not good to see so delicious cake 2 hours before lunch :) I feel hungry now. But I defnitely try it someday. That looks great! I'll have to whip up a gluten-free version! oh Natasha, that looks so yummy! i will have to give it a try! i heart anything zebra...i can't wait to try this out!!! Very awesome cake! It looks really neat. I saw this over on the King Arthur flour blog a while ago and have been meaning to make it. I keep thinking about variations, too. You are lucky to be in the southern hemisphere where it's cooler this time of year (though does Australia ever get really cold?). I am waiting until October to try it out. Yours looks marvelous. It has been 26 weeks of fun and being delightfully wowed by the choices we each presented. Your cake, it is simply the perfect end dessert to this Alpaha meme banquet! I've never made a Zebra cake before but it looks really yummy! Thanks for the de~licious looking pictures and the recipe. Thanks too for stopping by to visit, all the way from Australia!!! Natasha! Thank you for this recipe on my little stop here from Alphabe-Thursday's letter "Z". I am making this with the Grands this week. The middle one is enamored of all things zebra. I'm thinking I could let them make chocolate and vanilla icing in the same type of pattern! Oh, they will be happy, happy girls! You are always such a joy to visit. Thank you for being party of this meme. I am sorry I haven't visited for awhile, summer is very busy here at the beach. People who forget where we live during the cold winters suddenly want to come visit! And then we have our 4 little gkids a lot during the summer. Such fun, but very tiring! I have made marble cake, but never Zebra. It looks wonderful and I am copying the recipe, thank you! I have a cake posted that looks like a big Oreo cookie. It was fun! What a stunning & truly appetizing zebra cake!! It looks so lovely & apart!! Thanks for the step by step guide too! You have just inspired me for my son's b-day party!! I am going to do a Safari theme and the Zebra cake will be perfect!!! I used this recipe to do the rainbow one but never thought about "zebras"!! Thanks for sharing! Looks so fun and delicious! I am going to have to try it! Oh wow. I just have to try this. What a brilliant idea. My mouth is watering already and it's one the children can help with. Thank you. I just found your post and can't wait to give this technique a try! This cake is gorgeous! Thanks for sharing the recipe, I've only made marble cake...but this is great! Can't wait to try it! Happy Sunday. Looks yummy! Following you GFC! Love for you to follow back when you get a chance. I see you have a Saturday link up! Love for you to add it in my directory. Looks delicious!! Thanks so much for sharing at Romance on a Dime!! I'm pinning this. This looks so YUMMY! I have pinned it to my Let Them Eat Cake board. And I would love to have you come by, link up and show off this project at the Creative Corner Hop. The linky party begins every Monday and stay open all week. This cake is so cute! My daughter would love it. I would love if you would come and share this at Tried & True Thursdays. ,mmmm I saw that on pinterest and it looks amazing!